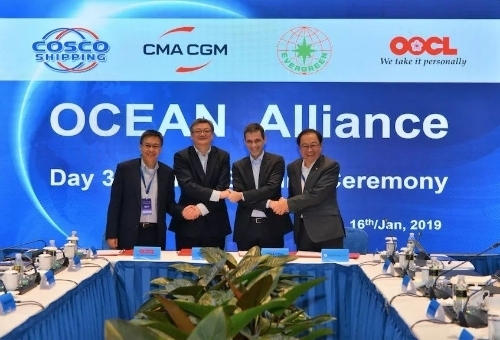 The OCEAN Alliance keep optimizing the service loops, by providing 7 service loops, faster transit time, better port pair coverage, more stable service and more selections is available to our customers. Zeebrugge, Rotterdam, Gdansk as hub can further extend to Spanish Bilbao, Ireland, and Baltic region like Sweden, Denmark, Poland, Finland, Lithuania and Russia. 17 Asian ports, 23 Mediterranean ports, 5 express services: 2 West Mediterranean Express, 1 calling Black Sea Express, 1 Israel Express and 1 to Adriatic Express. The Adriatic Express is one of the leading products in the market with most direct callings. Meanwhile, the Mediterranean service is further enhanced by Piraeus hub and owned feeder network and the China-Europe Rail Express service, which provide rapid and smooth connection to hinterland like Czech Republic, Hungary to the north and Egypt, Israel to the south, Spain, North Africa to the west. The PSW services provide direct service from China,Japan,Korea, S.E.A and other major ports to USWC including Long Beach, Los Angeles, Oakland, Tacoma and Prince Rupert. We provide frequent sailings: 4 weekly services from South China, 3 weekly services from North and Central China, 1 weekly service from S.E.A. The express services enable us to provide leading transit time for each destination in the market. The PNW services provide direct service from China, Japan, Korea and S.E.A and other major ports to Prince Rupert, Vancouver, Tacoma and Seattle,4 PNW services with different advantages , MPNW service first calling Seattle, CPNW first calling Prince Rupert, EPNW first calling Tacoma and OPNW first calling Vancouver in the Northwest. The broad coverage of ports in FE and rapid reach to port in Northwest US makes the product efficient and reliable. The AWE services provide direct service from China, Japan, Korea S.E.A and other major ports to USEC and Gulf including New York, Norfolk, Savannah, Charleston, Houston and Tampa. In the 7 service loops, 5 USEC and 2 Gulf services. 5 USEC services including 1 Central China New York express, 1 Central China New York Savannah express,1 Southeast Asia New York express,1 South China Savannah express and 1 S.E.A to New York express. 2 GULF services both provide Central & South China Houston express. USEC and Gulf service can provide excellent and reliable service by providing rapid transit time, good punctuality, broad coverage and high frequency of sailings. The service provide smooth connection between major ports in Europe and US including: New York, Savannah, Charleston, Houston and Miami express. We keep aiming to provide faster and better service to our customers. The Middle East services cover major ports in China and S.E.A as well as Jubail, Bahrain, Sokha and Hamad express services. South and Central China 4 weekly service with abundant space, 4 weekly service to Jebel Ali, 3 weekly service to Damman. By using Abu Dhabi as hub to reach Kuwait, Iraq,Oman and other Middle East countries. We can capable of providing leading fast transit time in the market. The Red Sea services connect major ports in China and S.E.A to broad coverage of Red Sea ports including Jeddah, Sokha,Aqaba,Djibouti express. By using Jeddah as hub we can further reach more ports including Aden and Hodeidah. Above service rotations are subject to review and market conditions.